“I watch the moon hang in the sky/I feel the traffic rushing by/Freight train engine in the night/I’m still here waiting for you/I feel the cold breeze in the air/My eyes blind by headlight’s glare,” sings Chromatics’s Ruth Radelet in their song “Headlight’s Glare.” Mimicking the wistful lyrics, the music is dreamlike, imbued with both a sense of melancholy nostalgia and potential unease. With references to headlights, traffic and trains, the song is steeped in the American romanticization of the road. A similar combination of everyday imagery–the glare of headlights–and the hint of menace can be seen in Dana Powell’s current exhibition Smoke Screen at Allen & Eldridge. Now, it’s no mistake that Chromatics cemented their place in pubic consciousness after their recent appearances in David Lynch’s Twin Peaks: The Return. And Powell’s paintings, with their expertly rich combination of the mundane and morbid, certainly fulfill more than a little of my current Lynchian fixations. In particular, Powell’s two paintings Night Drive (consequently the title of a Chromatics album) and Ghost Drive mine the spooky imagery of a highway at night, seen frequently in David Lynch’s creative output from the credits of Lost Highway to the music video for his collaboration with musician Lykke Li “I’m Waiting Here.” And no wonder both Powell and Lynch favor this scene–it’s the flip-side of America’s love of fast cars. Despite all its distinctly American optimism, the road also contains an underlying violence in its speed and unknown and unpredictable trajectory. For Powell, these night joyrides seem steeped in both freedom and danger. Take, for example, Ghost Drive, which, like Night Drive, portrays a dark bend in a highway, illuminated by headlights. 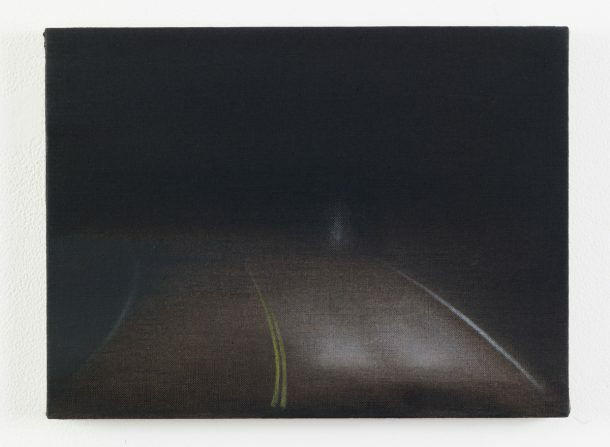 But, unlike the other canvas, Ghost Drive features a foggy mass in the distance. Is it, as the title suggests, a specter? Or is it just a highway mirage, seen after hours upon hours of driving? 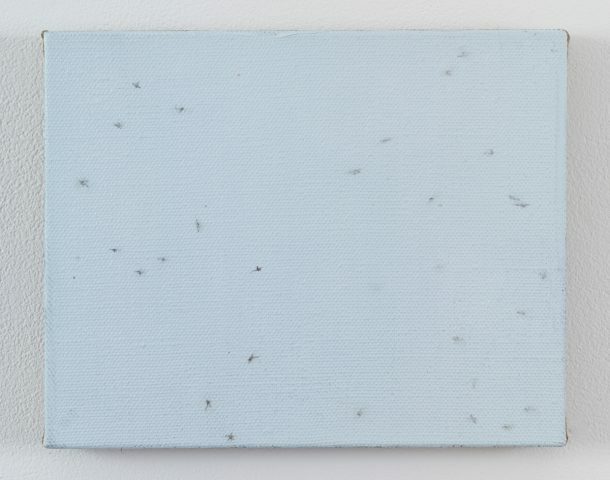 Powell, intentionally, leaves this–like most of her chosen scenes–ambiguous, permitting viewers to fill in their own stories and making these small canvases large with possibility. 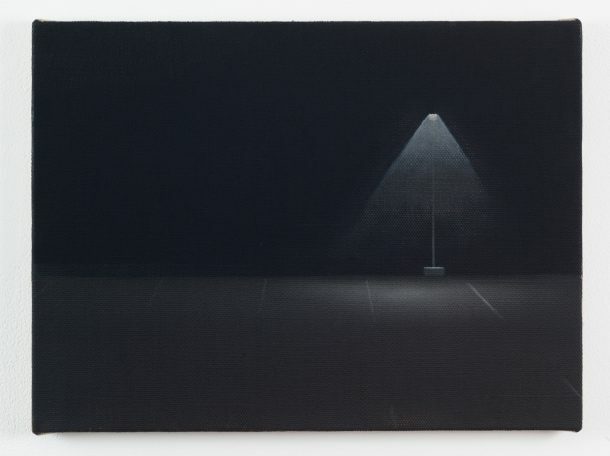 But, it would be unfair to just spend an inordinate mount of space comparing Powell’s paintings to Lynch’s expansive body of work, though their overlap in favored imagery is certainly striking, from billowing clouds of smoke to lost highways. Smoke Screen requires viewers to descend a steep set of stairs on Delancey Street in order to enter a white-walled space covered with a selection of minuscule canvases. Ironically, the two times I’ve come into contact with Powell’s work has been in a basement–the previous being Ryobi Room 6 in the basement of a bodega in Bushwick. This locale is somehow completely appropriate. Basements are ordinary spaces that can also, and I watch enough procedural crime shows to know, be places of horror. 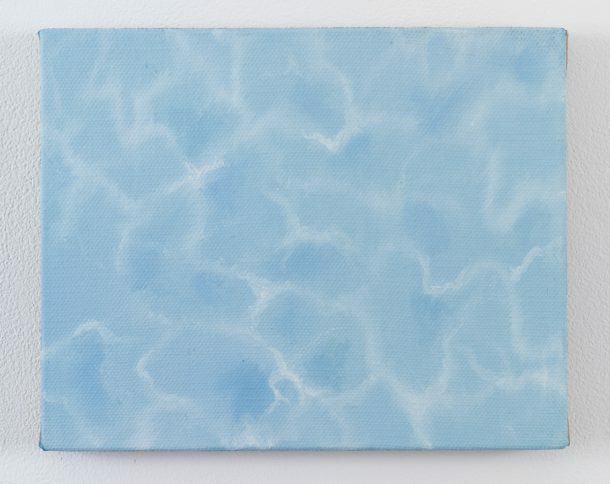 At first, the paintings in Smoke Screen seem innocuous with works like Daymoon and Pale Pool, which features an expanse of rippling artificially blue water in a conventional pool. It’s summery and chill with just a splash of David Hockney, right? But, that sense of relaxation is disturbed quickly by works like Punch that rupture this initial idealism. Displayed on an exposed area of the basement wall in Allen & Eldridge, Punch depicts a punctured hole in a white wall. 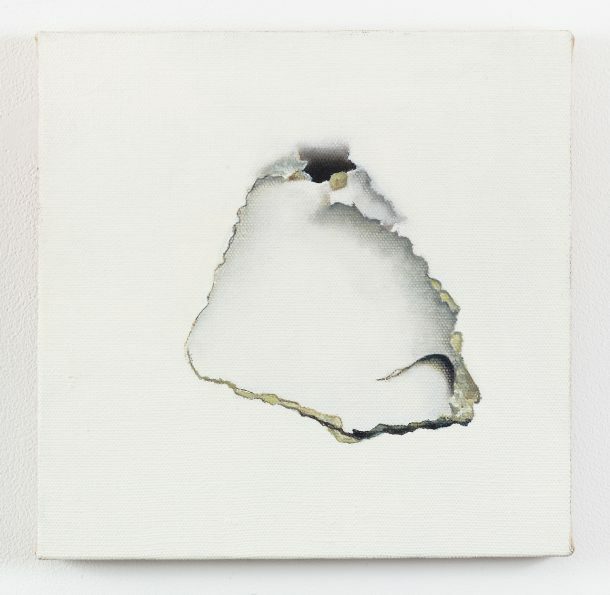 It, at once, indicates the remnants of violence and anger, as well as coyly references a disruption of the traditional, art historically preferred white-walled space. The commonplace, in Powell’s hands, quickly becomes ominous. It’s no coincidence that the title of the show is Smoke Screen, which is also one of the titles of a painting. Like a smoke screen, Powell obfuscates a definitive narrative in these works, preferring obscurity. But, where there’s smoke, there’s fire. And there’s quite a number of works that contain both, including Hot Box, which presents an elevator with smoke swirling from its base. 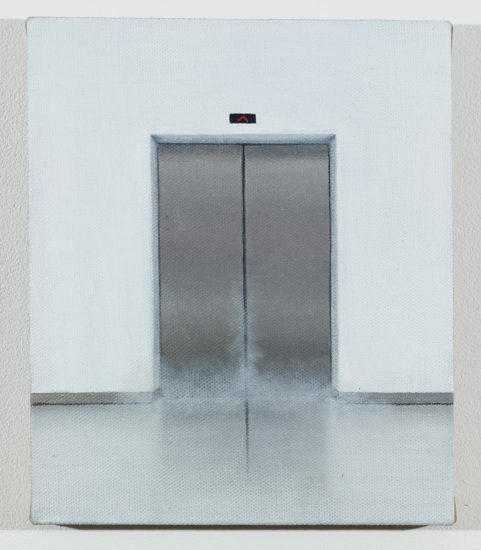 It depicts possibly one of my worst fears, as someone who is slightly wary of elevators. Powell, obviously, is clued in to our collective nightmares. In conjunction with these more obviously unsettling scenes, the seemingly innocent paintings like Pale Pool take on an alarming air. In this context, the movement in the pool reminds me of a final line in Nick Cave & The Bad Seeds’ song “Higgs Boson Blues,” which narrates the dissolution of society through various symbols including quantum physics and Robert Johnson selling his soul to the devil. Cave sings, “Miley Cyrus floats in a swimming pool in Toluca Lake…” leaving the scene purposefully vague. Is the star floating, face-down? Like Cave’s lyric, Powell’s painting features more than a hint of morbidity. Other works play out this tension between idealism and horror within the canvas’ picture plane. For example, from afar, Swarm looks like the sweet depiction of a flock of birds, resembling Felix Gonzalez-Torres’s Untitled (Birds) piece. But, on closer inspection, particularly after reading the title, the viewer realizes that this flock is really a swarm of mosquitos. Yuck. More than just her selection of simplistic yet emotionally resonant scenes themselves, the restricted size of the canvases enrich their impressionistic vision, which both unsettles and destabilizes. 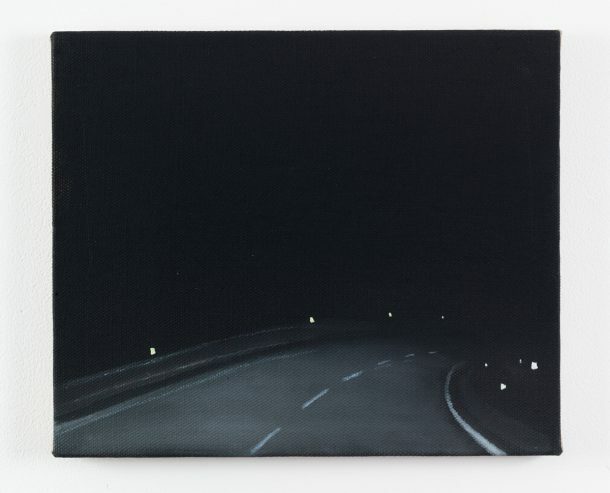 By restricting the size of her works, Powell zeros in on these seemingly unimportant, mundane scenes, showing how much narrative weight can be contained within a glimpse of a highway at night or an unexplained explosion. They also, despite depicting an undeniable American aesthetic, refuse monumentality–the entirely American urge to go bigger, louder and brighter. Instead, Powell places these moments of darkness firmly within the everyday–a disquieting drive, the seething unease of a parking lot at night and the dumb pride of a rocket’s red glare. 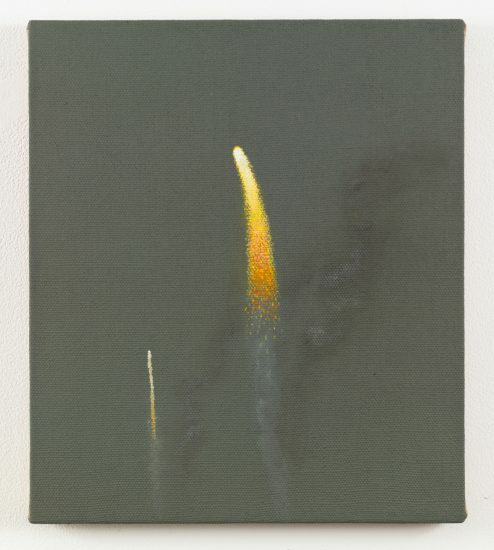 This dualistic vision of America is perhaps best represented in the ambiguity of works like Rockets. Is this a July 4th celebration, a missile test or an incoming bomb? In the press release, Allen & Eldridge reveals that the show’s works were “born of the restlessness and uncertainty the artist experienced after America’s recent election.” Naturally, the unease, translated through her canvases, speaks to our apparently unique Rome-Is-Burning moment. But, in a way, simplifying Powell’s paintings to some sort of political commentary does their range and scope a disservice. Not everything has to be about Trump’s America right now, sometimes paintings are just good, containing enough aesthetic atmosphere to allow viewers’ minds to wander. Powell’s works are, in a sense, timeless, at least from the mid-20th century on. We like to imagine we live in extraordinary times and in some respects, we do. But, the American dream has always been paired with a corresponding nightmare–its ambition comes with danger and its light with darkness. Tags: Allen & Eldridge, Chromatics, Dana Powell, David Lynch, driving, Headlight's Glare, I'm Waiting Here, James Fuentes, Lost Highway, Smoke Screen, The Big Dream. Bookmark the permalink.